A senior UN official has welcomed Bangladesh's plan to move Rohingya refugees out of the country's congested camps, but said any move to transfer some 100,000 of them to a flood-prone island should be voluntary. Volker Turk, an assistant high commissioner at the UN's refugee agency, said Thursday that the southeast Kutupalong camp, the world's largest and now home to some 600,000 Rohingya refugees who have fled neighbouring Myanmar, is highly overcrowded. 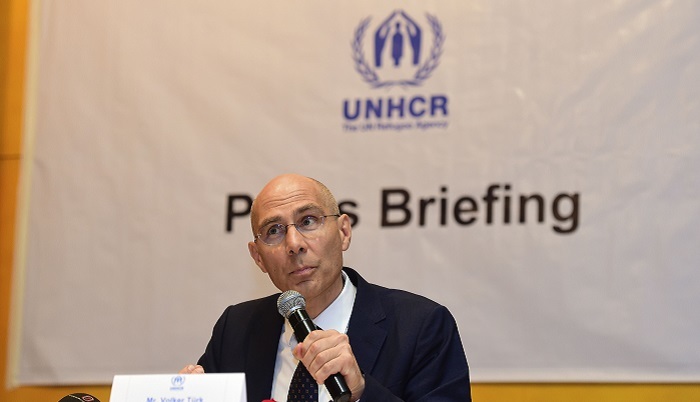 "If you have been in Kutupalong or various camps in Cox's Bazar area, it is clear that there is huge congestion," the UNHCR official told reporters in Dhaka after concluding a five-day visit to the country. "So we welcome the fact that the government of Bangladesh has taken very active steps to identify alternative settlement (for the Rohingya refugees)." He added that the UN was still in "discussion" with the Bangladeshi authorities about the relocation of refugees to the island of Bhashan Char, in the Bay of Bengal, but said refugees must be willing to move and be able to continue their "livelihood" there. International aid agencies including a UN rapporteur in January have raised concerns about the island's ability to withstand violent storms during the monsoon. Hundreds of thousands have died in Bangladesh from cyclones in the last 50 years, mostly in coastal areas. A senior Bangladeshi minister last week said moving refugees to the remote island, which is an hour away by boat from the mainland, will start from next month as the majority of the construction work has finished. Dhaka has spent some $280 million transforming the muddy silt islet that only emerged nearly two decades ago. Local officials have pointed to a newly-constructed three-metre (nine-feet) embankment around the island that they say will keep out tidal surges in the event of a cyclone. Many Rohingya have openly opposed the idea to migrate to the island, saying they would prefer to stay close to the Myanmar border. About 740,000 Rohingya Muslims have fled a brutal military crackdown in Myanmar's northern Rakhine since August 2017, joining some 300,000 refugees already living in camps in Bangladesh's Cox's Bazar district. Bangladeshi officials said the relocation would "lessen pressure" on the squalid settlements, most of which were built after clearing acres of forestland at a wild Asian elephant sanctuary. A Cox's Bazar official last week said they were preparing a list of refugees who would "voluntarily go to the island". Bangladesh had wanted to start relocating refugees to the island, strictly off limit to the media, last June before the monsoon season began. Prime Minister Sheikh Hasina was then slated to open the new settlement on the island last October, but the inauguration was postponed.